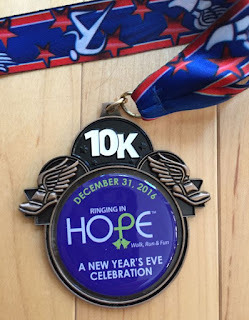 Racing Stripes: Ringing in Hope 10K Report: A 2016 Grande Finale! 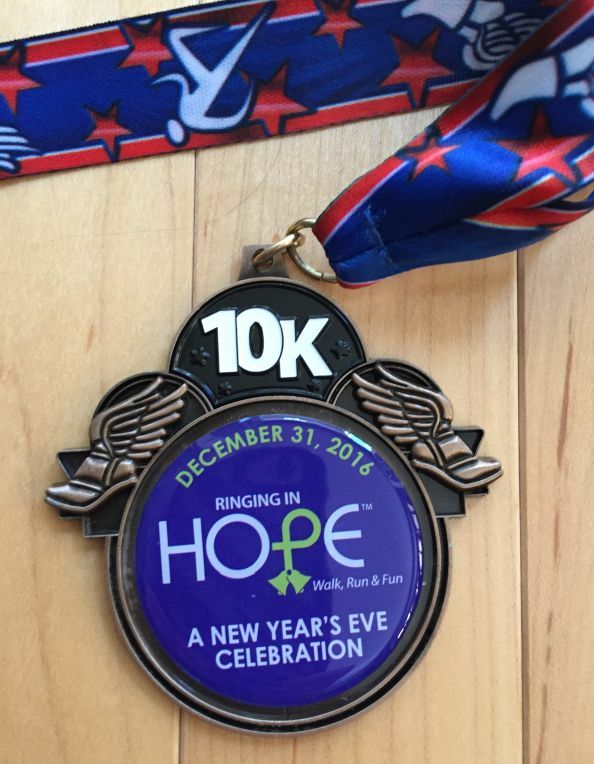 Ringing in Hope 10K Report: A 2016 Grande Finale! 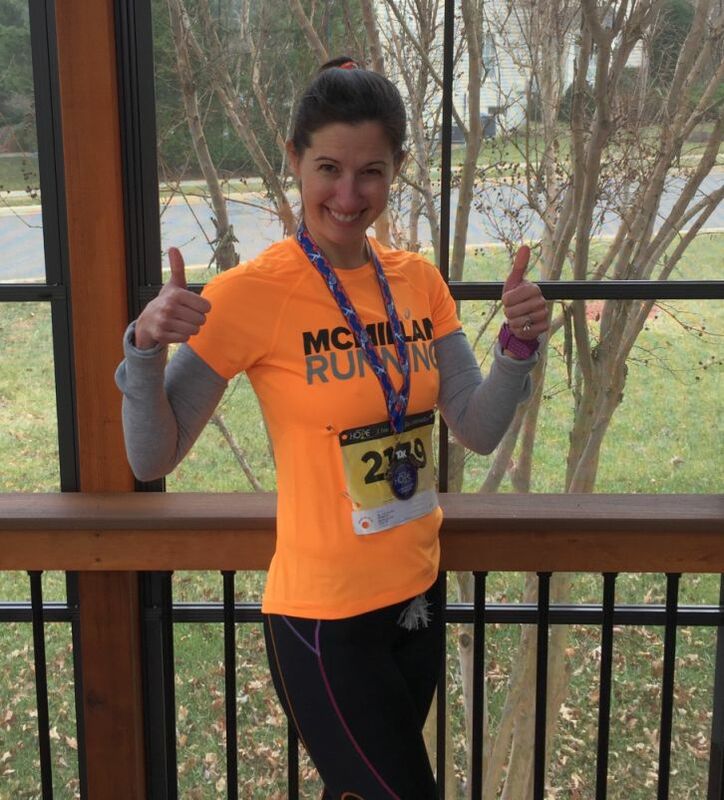 "I would like to participate in either the 5K or the 10K, but I don't want it to impact my half marathon. I also don't want it to impact my marathon training, because Myrtle Beach is fast approaching and I know I need to get my long runs up. 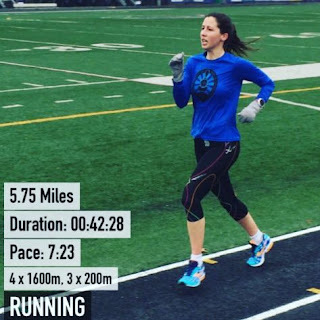 Can you think of a creative way of incorporating either the 5K or the 10K? Perhaps I could run at a tempo effort, and/or as part of my long run? Maybe the long run can be moved to January 2nd because I don't have to go to work that day? In any event, I'm open to whatever you think is best, given that my top priority is the marathon, followed by the half marathon. 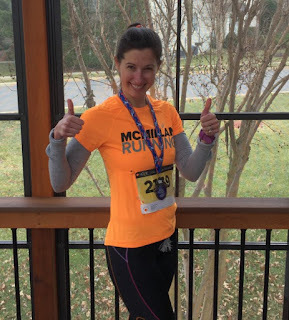 This New Year's eve race is more of just a fun thing." "That’s no problem at all. The 10km will fit in nicely as you’ll get your legs spinning quickly the week before the half marathon. You could run a few miles afterwards also but I’ll think about it more once you get through this week." So, it was on! I hadn't run a 10K since this race last year, when I ran a 44:18. My PR was from October of last year: 43:56. The good thing about this year's race was that they moved the course to a different location. So even though I had technically run the race six times, I had never run this new course. 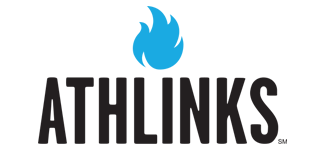 I had heard good things about this course, which is used for a 5K/10K Turkey Trot as well. I wasn't a fan of the previous course at all, so this change was very welcome. Most of my gripes about the previous course were resolved, although two minor annoyances still remained. First of all, they placed cones in the middle of the road and forced you to run outside of them, which made it impossible to run the measured tangents. This resulted in a Garmin distance of 6.29. Last year's course measured 6.27. I overhead many runners complaining about the cones and how at the Turkey Trot race, they don't use these cones. My other complaint was that the 10K runners had to weave around 5K runners for a good portion of the race last year. This year, we only had to weave around slower 5K runners during the last half mile. It was still annoying and made the finish more difficult, but it was an improvement over the previous year's setup. I've hit the lap button. My splits were 6:48, 6:43, 6:35, 6:30, 0:40, 0:41, 0:40. My previous fastest 1600m rep time had been 6:38, so during this workout, I ran two miles faster than that. And honestly, it didn't feel all that hard. This workout made me re-think my goal for the 10K. I had originally hoped to run somewhere in the low 43's, but now I figured I would probably be able to run the race sub-43:00, somewhere around a 6:50-6:52 pace. My revised goal was to run a 42:55 or faster and beat my PR by over a minute. For the remainder of the week, I only did easy runs so that my legs could recover for today's race. I continued my run streak, which started on December 1. I've now run for 31 days in a row, averaging 7.6 miles a day! That's 234 miles in December. The race started at 9:00, so I ate half a bagel with peanut butter at 6:30am. I then drank one serving of UCAN at 8:15 as Greg and I were driving to the race. It was 30 degrees, partly cloudy, with winds at about 8 MPH. After much debate, I decided to wear CW-X capri tights and a short-sleeved shirt with arm warmers. I figured I could remove the arm warmers if I got hot. Yes, it is possible to get hot in 30-degree temperatures if the sun is out. We warmed up for two miles and I decided to ditch the arm warmers before even starting. This ended up being a good decision because I felt comfortable throughout the race in short sleeves, arms exposed. I had studied the course elevation profile and tangents pretty carefully. Even though the cones made it impossible to run the true tangents, I did my best while staying on the correct side of the cones. My plan was to run the first mile at pace of 7:00 because it was a 71ft net elevation gain. The race started and a bunch of runners flew past me. I didn't let this faze me as I knew I would be passing many of them later in the race. I counted the number of women ahead of me. My friend Rochelle was in first place, and I was pretty sure she would win, and there were 4 other women ahead of me as well. I picked off the first of these women about halfway through the first mile, which put me in 5th place. Mile 2 was also a net uphill, and my plan was to run this at a pace of 6:57, but I ended up going slightly faster in 6:54. During this mile, I gradually passed the other two women who were ahead of me so that by the end of this mile, I was the third female. I knew there was no chance of passing the second place female, as she looked to be about a full minute ahead of me. I was relieved to be done with mile 2 because I knew that the next two miles were a net even elevation gain, with some gentle rollers. Now that I had the two slowest miles behind me, I gained the confidence to really turn on the gas. And that's when I started passing some men. Probably about 3-4 of them during this part of the race. I also still had Greg in my sights, although he was way up ahead. I had predicted that Greg would run the race about a minute faster than me, but at this point I could still see him, which was nice. I pretty much just cruised through these miles. The wind was a little bit of a factor during the third mile, but it wasn't too horrible. I felt really strong and I had a nice pep in my step. I also felt like I had a really good rhythm going in my head. Whenever I looked down at my Garmin, I was shocked to see my paces. At this point, my Garmin was showing an average race pace of 6:50, which was my stretch goal. The exciting thing was that the last two miles were a net downhill, counter-balancing the first two miles which had been net uphill. So I knew at this point I was setup for a huge PR and that I was going to crush my goal. I excel at downhill running and I actually ran my fastest-ever mile during this race. Kind of crazy to set a one-mile PR during a 10K. The most challenging part of the entire race came at the very end. The 5K runners merged back onto the course with the 10K runners, and because that race had started 10 minutes later, there were quite a few of these runners, going at about a 10:00 pace. I focused on the man who was running in the 10K about 30 feet ahead of me and tried to follow his path. The course narrowed, 5K runners were all over the place and you really had to pay attention to where you were going. In fact, one of the 5K runners decided he was finished about 10 feet before actually crossing the finish line so he started to walk at that point! In any event, I knew I was actually close to breaking 42 minutes, so I gave it everything I had and sprinted to the finish. My official finish time was 42:09. A PR by 1 minute, 47 seconds! WOW! My Garmin average pace was 6:43, and according to Strava, my actual 10K time was 41:42. A big difference! Which is why the cone placement irks me so much. 6:21 is the fastest mile I've ever run, and I also set an unofficial 5K PR as well: 20:13. Although I should note that the 20:13 was the second half of the course, which was net downhill. All that being said, my current 5K PR pace is 6:39, and I just ran a 10K at a pace of 6:43. I was the third overall female finisher, and that came with a $100 prize package of gift certificates. Rochelle, who was the first female finisher, won gift certificates to the same places, so we can all go there together to celebrate! I'm really looking forward to the Disney World Half Marathon next weekend. I think I will be able to run a solid race, in spite of the possibly unfavorable weather conditions. The last time I ran Disney (in 2013) it was 63 degrees and very humid. It was tough, and the extended forecast shows similar conditions, but I'm mainly going to focus on running a hard effort. After a difficult summer of being sick with mono, I'm thrilled to end the year on such a high note. I'm looking forward to 2017 and hoping to stay healthy. Congratulations on a great race and so many PRs set in one race! So crazy that you set a ONE MILE PR in a 10K, as well as unofficial 5K PR (I think you will set a new official 5K PR too). Love that the momentum of knowing you'd surely PR carried you to the end and that you won the gift cards, so you can your friend who won can go out together and use them. I hope you have a good recovery from this race and good luck with next weekend's half marathon! Thank you! Yeah, it's so awesome when you are racing and you just know you are going to set a major PR. Much better than when it comes down to a second or two and you're really "sweating it". Great wrap up for 2016 - so glad we got to close out the year with you guys! You've gotten back into killer shape in such a short time post mono. Very excited for Myrtle ... and to spend all our gift cards! I'm super excited that the gift cards were to the same places! It was so much fun seeing you race and having brunch afterwards. Great finish to the year after a tough summer!! Congratulations on a solid PR!! Happy New Year to you and Greg!! How exciting that you are crushing your goals after being sick all summer! Maybe time off your feet is the secret? :p Congrats! I think my body needed the long break for sure! Thank you. Congrats on the huge 10K PR! The name of the race - Ringing in Hope -how appropriate for you as you get back into racing and prepare for the half marathon. You are amazing! Despite how you were feeling this summer you are coming back with a vengeance!!! Congrats on your PR! Have fun at Disney. I am scratching my head wondering how I missed that you were running the half marathon this weekend. I didn't really post much about Disney, if anything. It's not a huge goal race-- I mainly wanted to stay in Animal Kingdom Lodge, and I figured I should do it while there was a half marathon going on! I loved reading this recap! I am SO HAPPY for you. I'm so glad that your coach gave you the green light on this race. What a confidence boost this will be for your half! 3 PRs in one day is pretty darn crazy. I really dislike 10K races that make you merge back into 5K finishers, but it seems to be a fairly common thing now. Most of the 10Ks in my area do it at least. I wish that sometimes there was just a 10K event, without an option of a 5K. Regardless, congratulations on a great, well executed race! I think that if they started the 5K 20 minutes later then at least the 10K runners would be running with people around their same pace. A 42-minute 10K runner would be finishing with 22-minute 5K runners, and the rest of the times line up much better. Seems like common sense to me! Yeah, my experience in 2013 in the half marathon wasn't the greatest. BUT, I'm mainly going because I've been wanting to stay at Animal Kingdom lodge ever since it opened. So I figured this would be a good time to do it. The forecast is currently calling for around 60 with rain, which isn't horrible, but certainly not great either. Run With Santa 5K: Hello Hill!